Description:- The premier biographer of the British royal family presents the updated inside story of the romance that has made headlines the world over—just in time for the royal wedding. 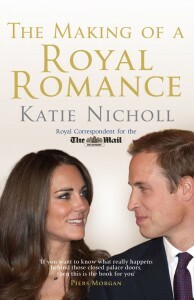 Review:- I found this book very irritating as the title gave the impression this was solely about William and Kate, but although very interesting most of the book was based on Harry and William and their history to the present it touched on their father’s romance , it spent a long time describing Harry’s love life and William’s past assignations. The book gave the background to William’s mistrust of the media and highlighted the very loyal relationship between the brothers. the wild side of both princes were noted in great detail with I assume the idea of showing that they were normal young men who would at that time in their lives live as normal a life befitting their age as they possible could under their very special circumstances. Eventually the author got round to discuss the main subject matter the relationship between Kate and William. I found the approach quite patronising to Kate as the message that came across was she finally got her man. The author in my opinion made a great deal of assumptions as to Kate and Williams thoughts and actions. She often described how they acted when in their own domestic privacy. Unless she was a fly on the wall or inside their heads she couldn’t possibly know how they felt in their alone time, I often got angry when she was describing Kate’s humble upbringing with their million pound residence. I suppose everything is relative. In it’s defense it was written in a very chatty unstuffy manner giving insight into modern royals and setting the scene through Williams commitment to his career the man that might one day be king and the patient Kate who might one day be queen. An interesting read but not the best book if you are looking for information on the happy couple. I will however be looking for another book on the Royal Couple to be and the place I will be buying it from is The Royal Wedding Bookshop. The Royal Wedding Bookshop is an online bookshop dedicated to Royal weddings and romance. The bookshop was created by a group of royalists and romantics who were sparked by the romance and now wedding of Prince William and Kate Middleton. In this bookshop you will find every book there is about the royal wedding(s), Royal Couples and Royal wedding venues. The bookshop features books and souvenir gifts on members of the Royal Family including the Queen, Prince Charles and Princess Diana. You can also find a large selection of wedding books ranging from wedding planning guides and wedding dress guides to books to help you write a wedding speech. An important fact about the bookshop is that half of the profits made go to The Diana Award, a charity founded by the Diana Memorial Committee to act as a lasting legacy to Princess Diana’s belief in the power of young people to change the world. The Diana Award is for young people who inspire the lives of others and so far 30,000 young people from the across the UK have received special recognition through this. The Award encourages exceptional young people to continue building a better society for all, carrying on the amazing work she started. What better way to support this great cause than by purchasing from this bookshop. The online bookshop was made possible by Eclector who create independent online bookshops based on shared profits. As well hosting its first Twitter giveaway the Royal Wedding Bookshop is entering every customer who buys a book from now until the 31st March 2011 into a draw to win a copy of the fabulous ‘Wedding Bible Planner’ by UK’s Luxury Wedding Planner and top-selling bridal author Sarah Haywood! Normally retailing at £35 this beautiful, detailed and practical organizer will become a cherished keepsake for every bride who uses it as her own bride’s bible. One lucky winner could end up getting two books for the price of one! You can also follow them on Twitter – www.twitter.com/RoyalWedBooks for latest news from the Bookshop and news on the Royal Weddings! Disclaimer:- I won this book and decided to share my review online.